HS another great successful "thrift-hunt"today! Found a napkin holder that matches my Pflatzgraff set, $2.06, at Goodwill. A little basket to hold sweetner packets and a deviled egg plate - each $1.00 at Hospice and they both match my white dinnerware set. Absolutely love this "Le Bain" sign for our guest bathroom - the colors are perfect! This "Happy Harvest" flat vase will be holding some fall colored flowers on our front door come fall! Goodwill - $2.06. My greatest buy today is these red leather boot. Red being my favorite color - I had to have them. Saw them one day last week, but the price of $15.06 kept me from buying. When I stopped by today, they were still there - meant for me to have them. I picked them up, went to the counter and asked to speak with a supervisor. Asking the supervisor, why these boots were priced $10+ more than the other boots on the rack, and they were missing the shoestrings. She said "how about $4", I said sold and paid for them. The boots are "Justin's", 100% leather, hand made in the great USA! Thanks for visiting - please leave some encouraging words! 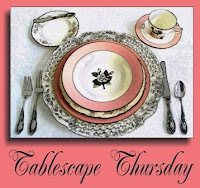 16th Barscape - Red & White - Perfect for Pizza! This week's barscape - my husband is making pizza - what better theme to plan a barscape for...Red & White is perfect! The plates are Johnson Bros. White/round ironstone. The silverware is Wm Rogers "Queen Bess". Matching red/white placemats and napkins with a white porcelain napkin ring. Handpainted red flowered wine glasses and a red pillar in a crystal hurricane lamp! Found the creamer at PAW's Thrift Store - $.25 - Pflatzgraff! Found the sugar bowl at Goodwill for $2.06 - considered myself very lucky to find the two pieces at such great prices and the same day! Two serving bowls, both Pflatzgraff - one was $.25 at PAW's and the other from Hospice $.79. All in all a very successful day of thifting and adding pieces to my Pflatzgraff set.